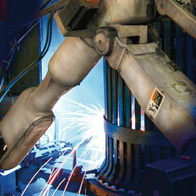 To ensure the integrity and consistency of their welds, most joints are electrically welded on precision fixtures by state-of-the-art robots that incorporate artificial intelligence welding techniques. Finished welded assemblies are then stacked and ready to be steel shotblasted, etched, phosphatized, preheated, and electrostatically powder coated. 114 queries in 0.893 seconds.